Middle School is dedicated to fostering in students a positive sense of self-esteem and an enthusiasm for lifelong learning. The Middle School offers a rigorous and challenging course of study that emphasizes development in traditional academic areas while also meeting the unique developmental needs of adolescents. Predicated on our Honor Code and committed to educating the whole child, the Middle School attempts not only to nurture individual students but also to challenge them to explore and develop their potential. Our program is designed to develop specific knowledge and skills in students, yet it has a larger mission to inculcate healthy habits of mind, heart, and action. Middle School teachers must simultaneously challenge and nurture, encourage independence yet provide structure, and reach curricular objectives while meeting each child’s needs. 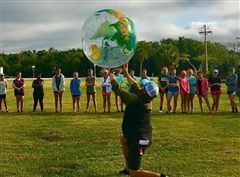 Essentially, the Middle School program must address the complex nature of adolescence in a supportive academic environment – one that makes the transition from Lower School to Upper School and from childhood to young adulthood as rewarding and productive as possible. 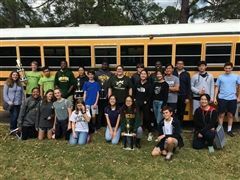 On Saturday, March 30, four Upper School math teams and three Middle School math teams competed in the Georgia Southern Invitational Math Tournament in Statesboro. The Varsity team of Joy Zhu, James Luo, Zoe Qian, and Alvin Adjei won the second place trophy in a field of about 25 teams from all over Georgia, south of Atlanta. The Varsity teams of Geena Panzitta, Angela Young, Stella Dong, and Junho Chang and Kevin Lin and Olivia Xue also placed in the top ten finishers at the competition. In the Junior Varsity division, Sowah Adjei won the third place individual prize out of 80 students, and the team of Sowah, Owen Elkin, Robinson Norman, and Cole Gensheimer won the second place trophy. 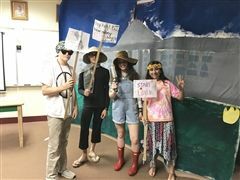 In the Middle School division, there were about 35 teams competing, and the team of eighth graders Aden Adjei, Phil Ajayi, Alysa Young, and Maison Miller brought home the third place trophy. Aden also took the award for second place individual in the middle school division. Tillman Clark, Nico Dascombe, Aidan Dunne, Preston Stone, Jacqueline Bunger, Ayo Ajayi, Jessica Elkin, and Pier Schneider also represented the school well. Congratulations to all the mathletes! 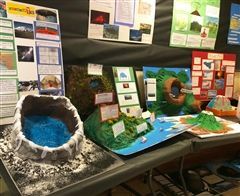 To further their studies on volcanoes from around the world, sixth graders were challenged with presenting their research findings in a visually creative and imaginative way! The volcanoes are currently displayed in Pape Hall and represent a variety of interpretations, from Mount St. Helens, to Mauna Loa!